we build web and app solutions for business of all sizes. we'll help you understand your tech problems and needs, every step of the way. No project is too big or too small; we endeavour to provide impeccable service in the face of any challenge. We work closely with clients, prioritising visibility during the development process to ensure on-schedule delivery. Whether it is a landing page, mobile application or digital platform, we understand how to take your project to its full potential in a way that best serves your business needs. We helped launch an online e-commerce store, so that AVGVS can showcase their range online, enabling international customers to shop their products. We provided a cross skilled team in data analysis, design, software engineering and business analysis skills to build a platform that matched and applied for tertiary scholarships for indigenous and Torres Strait Islander students. We partnered with Moffitt. Moffitt to bring the BT Panorama discovery film to mobile devices. We enabled a VR experience to showcase the benefits of the new wealth platform. 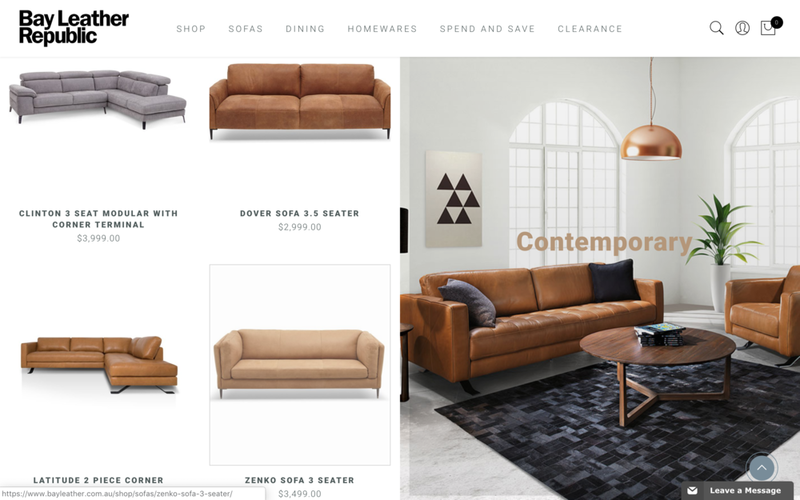 We created an online furniture store that helped Bay Leather Republic to reach a wider demographic, leading to an increase in sales and visibility.